An object’s provenance can have a profound impact on its value and it’s trajectory through time as it passes from one collector to another. At Art for Eternity we take pride in our commitment to thorough provenance research. We investigate the provenance of each art object we are interested it, and we only acquire objects with excellent provenance. The background lineage of a particular piece’s collection history adds a certain ineffable mystique and quality to an object of already exquisite aesthetic and historical quality. Additionally, because of patrimony laws, the earlier one can provide documentation of an object arriving in the States, the higher it’s financial value. 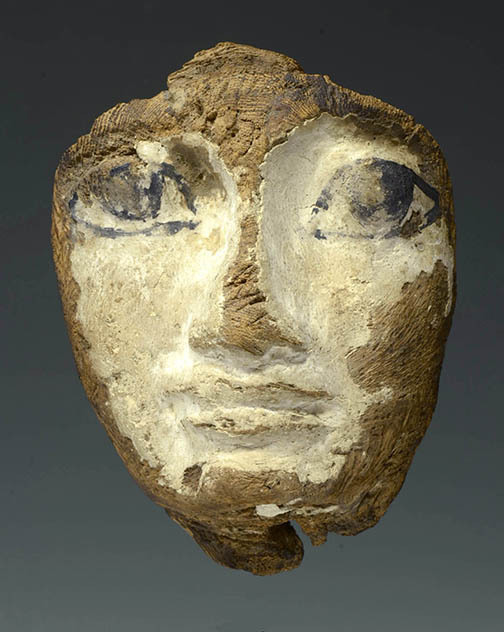 We are proud to offer you an inside window into our provenance research process for several new curiously beautiful objects we’ve recently acquired, including two Egyptian mummy masks and a set of Egyptian tomb figures. We noticed these mysterious Egyptian artifacts up for auction, and were struck by their timeless charm. In considering whether to purchase to the objects, we inquired as to the provenance and received documentation stating that they were originally from the collection of Dr. Wallace N. Stearns, a professor of Bible Studies at MacMurray College in Jacksonville, Illinois. 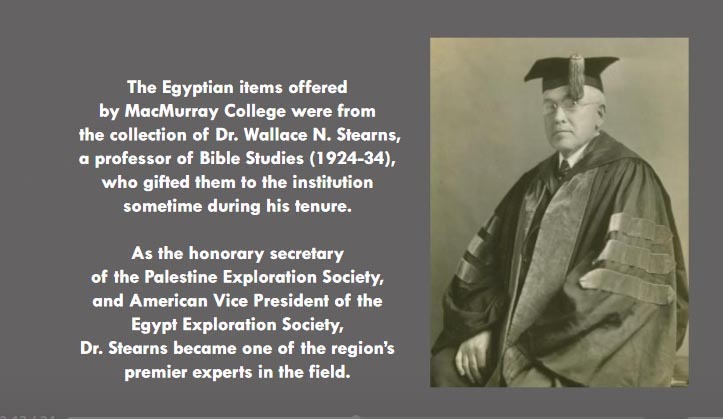 Dr. Stearns had acquired the pieces after they were retrieved from an archaeological expedition and donated them to the college sometime during his tenure, between 1924 and 1934. Upon conducting further research, we came across a stack of correspondence describing the objects. This correspondence included personal letters, inventory lists, and a detailed series of insightful research notes, hand written by a Mr. Bruce Williams at the Oriental Institute of Chicago. Williams’ meticulously cataloged and identified the culture, time period, and historical meaning of the Egyptian objects in the collection. Below is a snapshot of Mr. Williams notes regarding two of the masks that we now have in our collection at Art for Eternity. After communicating with a librarian at MacMurray college, we were able to verify that these documents were indeed authentic, and that the collection including these masks and figurines had indeed been acquired by Dr. Stearns in the 1930’s and donated to MacMurray college, where they have been ever since. We were then very confident about purchasing these objects at auction, and are proud to display them on our site. 13109. 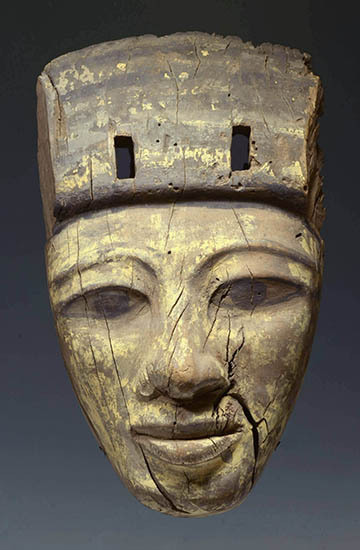 Egyptian Wood Carved Sarcophagus Mask, XVII Dynasty, c. 1200 BC, found by Julian Wadsworth in Ciaro in 1890. Also of note is this series of tomb figurines, which were a part of the same collection. These figures were placed in the tombs of royalty amidst elaborate scenes of everyday life depicting servants doing domestic chores, farmers and agriculture, and explorers sailing the sea in elaborate model boats. 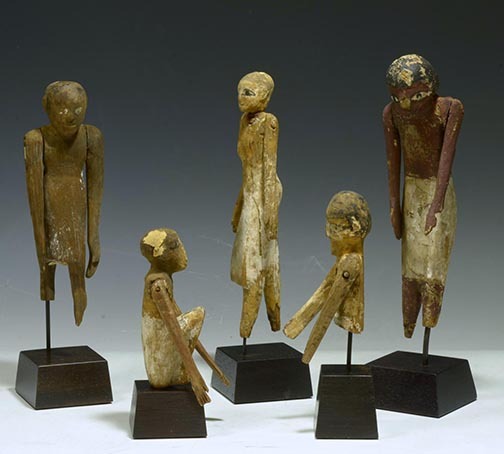 These mysterious figures, which appear to the modern eye as dolls or toys, were actually considered by the ancient Egyptians to be vessels of spiritual power which would draw the spirits of servants, famers, and sailors into the afterlife to support and assist the deceased, perpetuating a lifestyle similar to his life on Earth in a new “eternal abode” in his next life. If you come across two artifacts from the same time period, with equal aesthetic quality and beauty, and are wondering why one object is much more expensive, it is worth taking the time to investigate the provenance. Although not always, you will often discover a great correlation between an increased value and a solid provenance that can be confirmed through investigation such as these Egyptian artifacts that we have recently acquired. If you ever have questions about the provenance of an object or need a qualified appraiser to conduct provenance research for you, we are happy to assist you.